Our family has several mascots who take adventure trips with us. Dash—he’s a bison from South Dakota—Wall, SD to be exact. He got his name because well he rides on the dash of my suburban. He has a flat hair problem but he’s cute anyway. Then there is Frog—he’s (you guessed it) a Frog. He is from the Omaha Zoo. I am just glad we didn’t bring the octopus home. 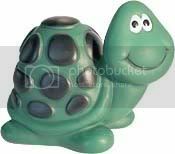 Today I feel like I should have a turtle as my mascot. I am off the crutches from my hip surgery. I am SO thankful for that. I cannot tell you how much I disliked being trapped with those crutches. I also cannot tell you how much better I feel from surgery. That makes me smile even as I poke along from room to room. Now I just need a stuffed turtle . . .
No idea what is in the freezer!